About Your Job: Here is your ticket to a new career with the World’s Leading Airline. We are going to hold a Recruitment Event in Amman, Jordan. If you have the drive for excellence, language skills and passion for service delivery, then this opportunity is for you. 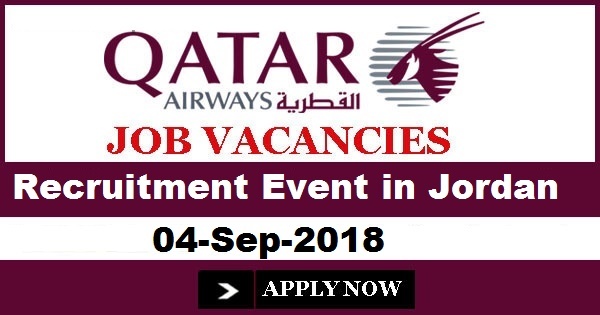 We have different open positions across different areas of Business including Al Maha Services, Hub Customer Services, Hub Lounges, Contact Centre, Doha Sales and Qatar Duty Free. We are looking for talented individuals to join our award-winning team. About You: For the above roles, fresh graduate with hospitality background are welcome, as well as candidate with work experience in the filed of Airport/Airline, Hospitality, Call Centre, Retail and Luxury establishments. You should have a minimum of 2 years experience in customer services in an airline/travel industry or other work area with a hospitality focus. You must be highly personable and possesses fluency both in Arabic and English language. You are proficient in computer applications. The role requires you to work on shift. Important Notes: Qatar Airways Group does NOT charge candidates for application forms or interviews.